Google’s development strategy is more agile, and products are consistently updated with new features and improvements. For example, in 2010, Google implemented 130 feature releases for its Google Apps Platform. For Google Apps users, new product additions can be overwhelming to keep track of, so today Google is making it easier for customers to access the latest Google Apps features in the timeframe that makes sense for them. Users can now choose between two feature tracks—rapid release and scheduled release. Rapid Release users will have access to new features as soon as the features have completed testing and quality assurance, and are ready to roll out. Scheduled Release users will access new features on a weekly schedule, with at least a one-week notice following the initial feature launch. These users can also preview feature releases on a test domain. Both rapid release and scheduled release will involve new feature additions for most of th products in the Google Apps Suite, including Gmail, Contacts, Google Calendar, Google Docs and Google Sites. Google says that they expect small business users to participate in rapid release and larger enterprises with more complex IT environments to choose the scheduled release option, as they may need to train more staff members in the new functionality. As Rajen Sheth, group product manager for Google Enterprise tells us, the new release timings give users more visibility into what’s new and how these features will best serve a company or organization’s users. Sheth says that Google has also developed a communication tool, “What’s New,” to allows users more visibility into Google Apps feature releases, and includes training instructions and more. Because Google Apps is based in the cloud, feature releases don’t involved downloading a new client or updates. You simply refresh Google Apps to access new features. 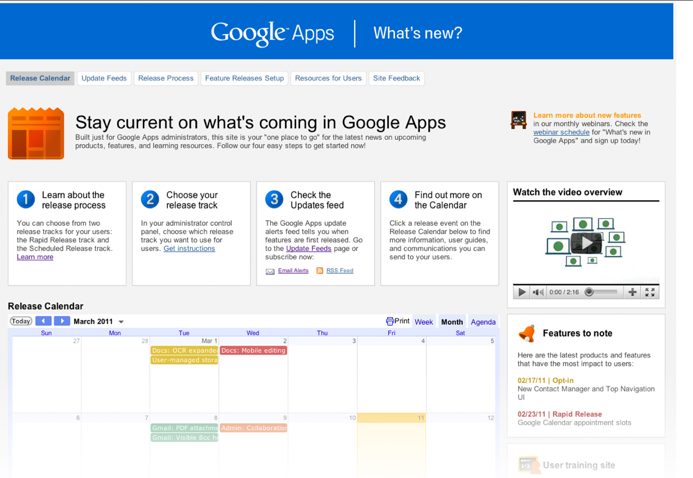 The timeline choice gives Google Apps users more insight into what they are actively adding to their existing product.